We’re open for golf this weekend! Come out and play this weekend! Beautiful weather and a new year for golf, what could be better. We are open for golf starting at 11am this Friday, 1/4 through Sunday, 1/6. Cart path only rule applies. Join us for Euchre game night and a special dinner! 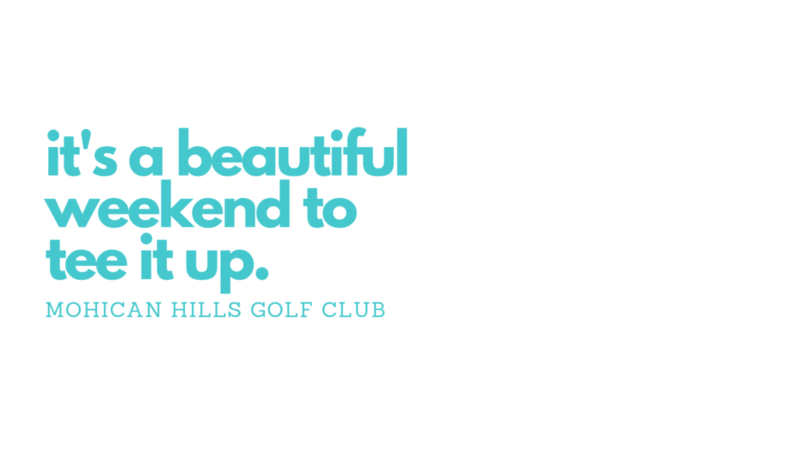 https://mohicanhillsgolfclub.net/wp-content/uploads/2019/01/beautiful-weekend-3.png 1080 1920 Teesnap Developer https://mohicanhillsgolfclub.net/wp-content/uploads/2018/01/logo-new.png Teesnap Developer2019-01-02 15:55:382019-01-03 10:06:30We're open for golf this weekend! Sunday Brunch Buffet Have any golf goals for 2019?